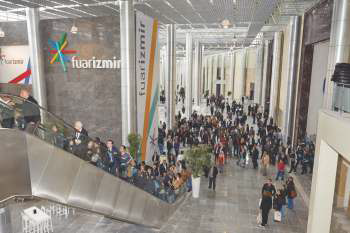 Fuarizmir welcomes you with total 119,000 m2 field consisting 4 indoor halls and an outdoor exhibition area. Fuarizmir, constructed by the equity of Izmir Metropolitan Municipality, hosts several international fairs and organizations in accordance with the need of the sector. There are 4 indoor halls and an outdoor exhibition area, and 51137m exhibition hall in fuarizmir. In 2015, there were 1562 participants, 373 international participants from 27 different countries; Italy, China, India, Greece, Spain, America, Iran, Germany, United Arab Emirates, England, Egypt, Indonesia, Romania, Ukraine etc. in Marble 2015 - International Natural Stone and Technologies Fair. There were also 51149 visitors and 7442 foreign visitors from 35 different countries; from America, Austria, Azerbaijan, Bangladesh, Belgium, China, France, Germany, Greece, India, Israel, Iran, Italy, Japan, Morocco, Russia, South Korea, Spain, Switzerland, United Arab Emirates, United Kingdom and so on in Marble 2015 - International Natural Stone and Technologies Fair. Natural stones such as marble, travertine, limestone, onyx, diabaz, andesite, basalt, granite, decorative and art products are exhibited in Marble - International Natural Stone and Technologies Fair. Furhermore, technologies such as mining machines, factory and plant machineries and environmental protection, recycling and recovery systems are exhibited in the Fair among with the consumables and heavy equipment. MARBLE, being among the world's top three stone fairs, is the right place to display new products, to meet with buyers from all over the world and to follow the trend of the sector.